When my heartmate and I finally put down some permanent roots in my hometown, an important part of our checklist was creating a fab patio. We were lucky that the home we found in the burgeoning El Sereno neighborhood had one, but let’s just say it needed a little (or a lotta) love. Even the surrounding backyard was kind of janky but we knew that with a little imagination — and a lot of elbow grease — we could turn it into a place we’d be proud of. We're not planning to do any serious renovating here and y'all know I'm all about cheap and cheerful fixes. And we couldn’t have done this transformation without eBay! Literally everything we used to makeover the patio, from the hanging plants to the pillows came from there. That’s right henny! We're excited to partner with eBay to create our outdoor oasis! So hop on over to check out their Décor Hub for all your outdoor essentials! Let’s take a look at the before outdoor space, shall we?! Our home is on a hill and it has this covered deck in the back. It was painted a bluish grey color with a picket fence. The roofing is a poly corrugated material. It’s not a terrible space. The structure has so much potential! So I decided to use an airless paint sprayer and painted it all white to give it more airy feel. If you followed my stories on Instagram, you’ll notice that I also chopped off the picket tops and bottoms so it looks more like a railing. When I started to imagine how I wanted the patio to look, I took inspiration from all my travels but I also wanted it to be like a little piece of our New Orleans casa right here in LA. Here’s what it looks like without all the layers of color and textiles. I think it look so serene and beautiful still but you and I both know I need my colors. More is more, darling! Bada bing bada boom! Now we got color, plants, and beautiful furniture up in here! I knew I wanted to do my signature mixing of patterns, colors, and styles (a vintage vase here, a new sleek modern planter there, etc.) so I started with a neutral colored base, which is also helpful in the case that I change my mind with the décor one of these days. We all know I can’t leave anything alone for too long! Okrrr! For my neutrals, I chose two white teak sofas, a jute rug, black rattan chairs, and a large black round coffee table. 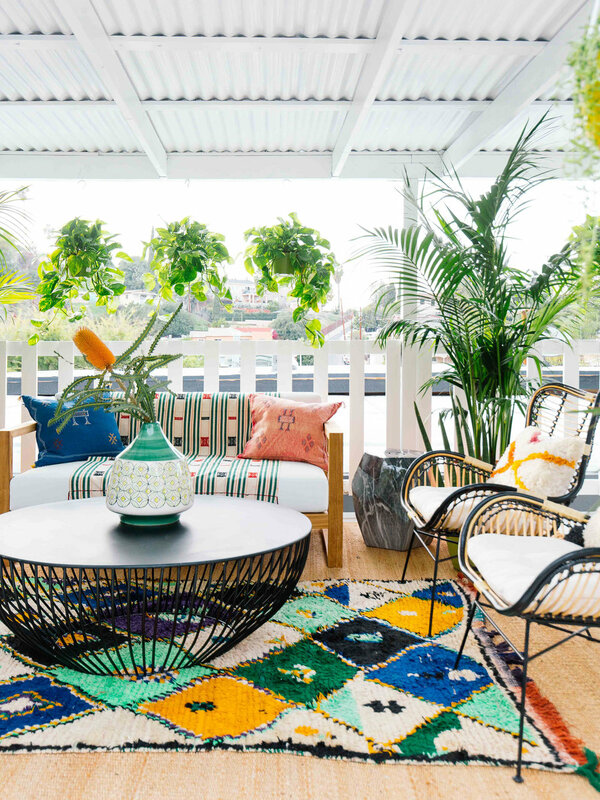 A few other must-haves for the patio were tons of plants to create a sense of privacy, a rich mix of textiles, plenty of seating for guests, and a little bar area for entertaining. We want this to be a multi-functional space that could be used for anything from hosting Ru Paul’s Drag Race viewing parties (Yaaas! I want a project out there!) to having a romantic dinner al fresco. I love me some options! When it came to styling the space, there was an overall theme. I was gravitating towards lots of woven lines. You’ll notice them in the yellow Acapulco chair, butterfly rattan chairs, French style bistro dining chairs, and even in the coffee table. And the colors were mostly inspired from the beautiful Moroccan rug found on eBay. I got my high school homies to come over and help us install all the new pieces. To sweeten the deal, I bribed them by offering to throw an impromptu, inaugural bash. We all celebrated with my favorite outdoor eats, spring rolls and bahn beo, a Vientamese streamed rice cake filled with savory goodness. And because our patio also includes a stocked bar cart, you know there were some cocktails involved. It ended up being our official kick-off for spring and for the new space. As much as we love our NOLA home, I can’t help but be extra excited about having a place of our own so close to where I grew up, where both my friends and family live. And now I get to check off another item on my wish list, a beautiful outdoor space where friends, family, dogs, kids, whoever can come together to catch up and enjoy each other’s company. And when it’s time to just kick back with a good book and enjoy a morning macchiato and some quiet time listening to the city noises and watching the sun peek over palm trees in the distance, I can do that too. Okay, I know y’all are dying to get the sources. Here’s how you can get the look all on eBay! Check out Décor Hub to create your very own outdoor oasis!